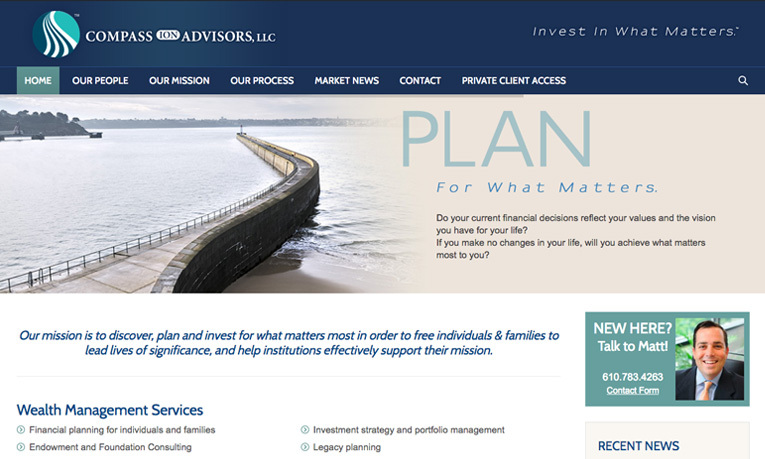 Compass Ion Advisors, a wealth management firm located in Conshohocken, PA, needed to more accurately reflect their highly personalized and purposeful approach to investing. Starting with focus groups and brand strategy brainstorming sessions, we landed on “Invest In What Matters” as their brand statement. We then developed an impactful brochure, identity/tagline/collateral, and website refresh. Through the discovery process “Discover, Plan, Invest”, Compass Ion works on a highly personal level with clients to chart their course wealth. management. © Uncomn Creative Inc. 2009-2017. All rights reserved.